An army troop marching at full cadence, is ordered to stop marching and walk across a bridge at each soldier’s own individual gait. This is due to the fact that the “in time” stepping produces vibration and the multitude of soldiers adding to the waves of vibration could bring the bridge tumbling down. When trying to think of waves, think of waves in water. Opposing waves can cancel each other out, but like the troops moving in the same direction, the waves can add to each other and gain extra strength! This is Harmonic Vibration. Did you know that there are notes within a note? Each note has a repetition of steps and this is called the harmonic series. If we could hear within any note, we would see that it contains other notes by way of harmonic subdivision. However, each new cohort has less volume than the previous one and eventually fades into the background. The first five harmonics on a vibrating string are shown below. The waves from the harmonic root note are often referred to as father, children, grandchildren. It is also the subdivision that occurs when events of vibration intersect, much like waves in the ocean and an atomic vibration. Everything in our world is sound; even our perception of color is sound vibrating on different frequencies. It is these harmonic vibrations that turn matter and energy into form. I was very intrigued and awed at the examples of sound and matter that I found during my research. One of the most interesting discoveries were the geometric shapes and patterns of runes located within these harmonic vibrations. Many of the experiments that I found while writing this article, was done using water. Water reacts very well to harmonic vibrations and as we all know, water is a major element of our body and environment and therefore a major influence in our being. “In 3D standing waves, a structure, with all characteristics of a platonic solid, is formed for each standing wave mode. Within an atom, which is the building block of matter, the platonic solid is not formed by salt or known particles, but by electromagnetic waves in vacuum. Both the students of Buckminster Fuller and his protégé Dr. Hans Jenny devised clever experiments that showed how the Platonic Solids would form within a vibrating / pulsating 3D sphere. In the experiment conducted by Fuller’s students, a spherical balloon was dipped in dye and pulsed with pure sine wave sound frequencies. A small number of evenly-distanced nodes would form across the surface of the sphere, as well as thin lines that connected them to each other. If you have four evenly spaced nodes, you will see a tetrahedron. Six evenly spaced nodes form an octahedron. Eight evenly spaced nodes form a cube. and twenty evenly spaced nodes form the dodecahedron. The following 3-Dimensional Standing-Wave Patterns in Liquid picture was a wonderful visual aid the experiment results. Not only do harmonic vibrations create visual patterns , but they also create color. When examining the energy that is made from oscillating electric and magnetic disturbances, we see the electric and magnetic fields come together in waves that are perpendicular to each other and create a disturbance. This form is called Electromagnetic Radiation (EMR). So how does this apply to Odinism? As of recently, I have found myself being more influenced and intrigued by Heimdall. In believing that myth is the symbolic expression of primal truth I’ve thought about this great guardian of Asgard; the culture bringer, the shining one, sitting at the head of the Bifrost bridge, Loki’s bain, patiently waiting to sound his horn… light and sound. Light and sound are basic needs of meditation and oneness, in my experience light and sound (sometimes the lack of) for meditative purposes is very useful. The sound and vibrations created from Galdoring, is a pure force of energy and this is why it is so important to our faith. I know there have been times when we have galdored during our blots and it was so in tune that it was like leaning on a wall. This exact energy was the reason that has led me to discover harmonic vibrations. The Greek words for “harmony” (harmonia) and “number” (arithmos) both derive from the Indo-European root (a)ri, recognizable in such English words as rite and rhythm. In Vedic India, rta meant unity or cosmic order. For me it all just seems to fall into place. 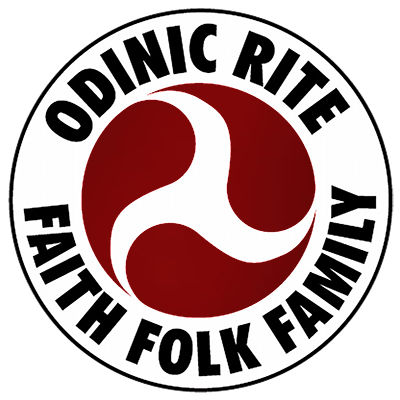 Like Heimdall’s horn, Gjallar, will sound loud and clear in all the worlds, The Odinic Rite shall create waves of focused energy that will open doors both mentally and physically amongst our Kin. Much like the marching army troops creating waves of vibration, we will create a focused wave of energy for our faith, folk and family. This subject is a deep well and it goes in many directions I strongly suggest you do more research on this topic and see with your own eyes the complex and yet simplistic topic of harmonic vibration.